What do Hyundai trains suffer from? It is not so easy to get into the depot where Ukrainian High-Speed Rail Company (UHSRC) trains are serviced and repaired. The 9.8-ha complex is protected with a tall barbed-wire ferroconcrete fence and strictly guarded. There are two large structures inside this “fortress”: a smaller one for washing and a bigger one, 240 m long and 48 m wide, for repairs and maintenance. Between them are 16 connecting tracks. This facility, designed for servicing 25 high-speed trains, cost the state one billion hryvnias shortly before Euro-2012. Another complex like this was built in Kharkiv. The trains are serviced after every trip. At first, a HRCS2 train, made by the South Korean company Hyundai Rotem, is cleaned of all surface dirt in the washroom. This leaves a lot of big heaps of frozen snow under the cars. Station workers say this snow will melt and seep into the warm repairs and maintenance shop, where the train will go next. The South Korean train covers these 200 meters with the help of a ChMEZ switch engine. But UHSRC manager Leonid Loboiko says that a system will soon be installed, which will allow electric locomotives to move on their own across the complex’s territory. The maintenance rooms have already been equipped with the poles that touch the overhead high-voltage wire as the train moves and then assume the initial position as the train is being serviced. 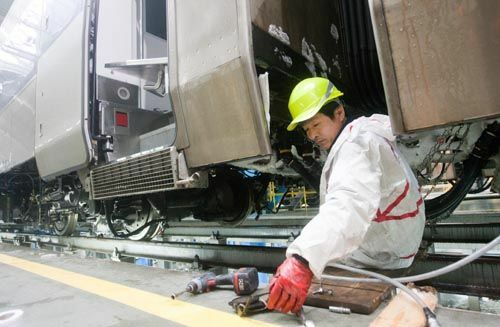 The main repairs and maintenance complex is designed for servicing four high-speed trains at a time. According to Loboiko, state-of-the-art technologies and the new organization of technical maintenance allow checking all the systems of an electric train on the same shop floor. “Here it is possible to simultaneously carry out such operations as filling the train with water and sand, cleaning and disinfecting the vacuum toilet system. The new technologies also allow changing wheel pairs and bogies without decoupling the car and using the hoisting mechanism,” the UHSRC manager says, explaining that, for the first time on Ukrainian railroads, specialists have a three-level access to a train. “We borrowed this technology from the Finns,” Loboiko says. Experts have now easy access to both the lower and the main parts of a train. In addition, there is a balcony above, from which it is convenient to service two trains. A special company deals with the cleanup of cars. We notice a crack in the windshield of an HRCS2 that stands on the shop floor. Loboiko calms us, saying that this small problem will not affect the safety of a moving train. And the window itself will be replaced soon. It will be recalled that big and small faults have become a virtual “hallmark” of these South Korean-made trains in Ukraine. This became especially evident with the onset of a cold spell, when delays in the movement of HRCS2 electric trains began to occur at an increasing rate due to technical defects. This caused outspoken discontent and harsh criticism of the government among passengers. As a result, Viktor Yanukovych expressed his dissatisfaction over the purchase of South Korean high-speed trains. “The winter showed that there are faults in the braking system, conditioners, compressors, and, what is more, in a special device that switches the train’s work mode from one to another. High-speed trains are dual – they can use both direct and alternating current. The frosting of this system is the main cause of a train coming to a halt,” Loboiko pointed out. He also mentioned the problem of self-contained power supply, when the trains that stopped out in the field were quickly losing electricity due to weak batteries and it became cold in the cars. “It was decided to install storage batteries with a capacity 1.5 times higher than usual. Besides, Ukrainian-made batteries are being tested today on one of the trains,” the UHSRC manager says. At the same time, Loboiko failed to explain the problem that arose during the very first trips, when a South Korean-made train tore down hundreds of meters of the overhead wire and broke the rooftop electrical equipment. The Ukrainians could see the result of this breakage in a notorious video that showed a ChMEZ drawing the failed HRCS2. Clearly in view were broken windows with characteristic marks left by torn wires. But Oleksandr Tolkachov, UHSRC first deputy manager, agreed to explain the situation. In his words, the French-designed Faiveley current collectors, made at the Czech factory Lekov, were too rigid and not springy enough in comparison with those installed on Ukrainian-made trains. “Now the producer is changing the pantographs. This modernization will have been done on all the trains by March,” Tolkachov emphasized. It is the company Hyundai Rotem that is responsible for routine maintenance, warranty repairs, and spare parts supply. It also pays for all this work. The South Korean team (over 40 specialists) leader, Osman Kopurluoglu, who came from Turkey, confirms that most of the problems were caused by an unusually cold winter. “When it is very cold in winter, I, a human being, fall ill more often – and so does our train. Snow is a problem. Then there’s a rainfall followed by a frost. We had to change some things in the train with due account of the weather. We knew that there would be delays and could well imagine what passengers felt like. I sincerely apologize for this,” Kopurluoglu says. He is sure there would be no more problems after the current modernization. To be on the safe side, the Koreans are already sharing experience with Ukrainian specialists. “We will stay here for five years. The young Ukrainian engineers and workers are already doing many things here,” Kopurluoglu added. At the same time, the UHSRC manager agrees that many problems could have been avoided if the South Korean trains had undergone full-scale four-season tests, as is usually done in the railway sector. “We are still running in these trains,” Loboiko stressed. He noted that urgent measures had allowed normalizing the schedule situation as soon as January 2013. “There was only one contingency on the Lviv-Kyiv train earlier this year,” the company manager said. 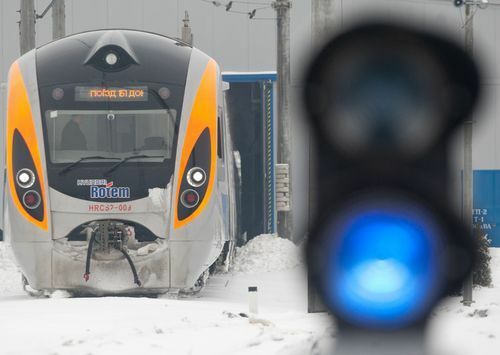 At the same time, Loboiko said that 10 UHSRC-owned Intercity trains produced by the South Korean company Hyundai Rotem and two produced by Skoda Vagonka had carried about 1.2 million passengers since May 27, 2012. “The demand for high-speed trains continues to grow. As of today, the passenger load of high-speed express trains has reached 52-53 percent. For example, the Kharkiv-bound trains are almost 90-percent loaded. The lowest – up to 30 percent – passenger flow is in the trains bound for Lviv. There are still fewer passengers on the nighttime Donetsk-bound train,” the company manager said. In his words, the average usage of capacity in the high-speed trains was 27 percent in the summer during Euro-2012. Yet Loboiko refused to disclose the profits derived from using the Hyundai trains. But he claims that, without taking into account the financial leasing expenses, there is only one loss-making itinerary – the Kyiv-Donetsk night train. According to the UHSRC manager, one of causes of low passenger traffic on the Lviv-bound train is absence of stops on the route. He says Ukrzaliznytsia is already tackling this problem. “They study the possibility of transferring this itinerary to the line that passes through Zhmerynka and Ternopil. But do not forget that a one-minute stop means 10 minutes of lost time,” Loboiko stressed. Loboiko also says that a possibility is being explored to launch Skoda double-decker Intercity trains in the summer from Dnipropetrovsk, Kharkiv, and Donetsk to Simferopol. It is panned that it will take a high-speed train 5 hours to travel from Dnipropetrovsk to the Crimea, about 6.5 hours from Donetsk, and 6.45 hours from Kharkiv (see Den, No.17. January 31, 2013). He does not rule out that the Ukrainian High-Speed Rail Company will soon acquire a new dual-system high-speed electric train made by the Kriukiv railway car-making factory, which has been run in on Ukraine’s tracks since last summer. The UHSRC manager believes that his company’s technological capacity will make it possible to use this train, too.